A University of New Brunswick (UNB) spinoff company that provides nuclear magnetic resonance (NMR) solutions for the oil and gas sector has celebrated nearly a decade of growth by declaring dividends for the first time. 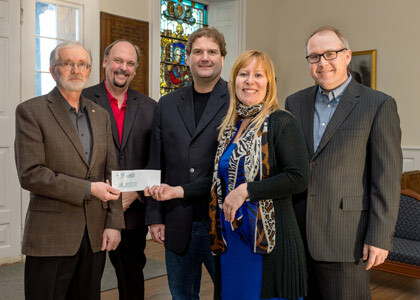 Green Imaging Technologies' (GIT) CEO Jill Green and President and Chief Technology Officer Derrick Green presented the University of New Brunswick with a cheque for $14,000 on Jan. 22. UNB's Office of Research Services held a celebration for the UNB alumni, who have continued to partner with, and commercialize technology developed at, UNB. "The strategic cornerstone of our company is the unique and close relationship with UNB’s world class MRI Research Centre headed by Dr. Bruce Balcom," says Jill Green. "GIT acquired the rights to the underlying technology for GIT Systems from the MRI Research Centre in 2006." GIT supports ongoing research at UNB through annual contributions to the Natural Science and Engineering Research Council (NSERC) and Atlantic Innovation Fund projects. The ongoing partnership between Green Imaging Technologies and UNB promises to advance innovation and diversification within the area of magnetic resonance imaging, to the benefit of the regional economy.